Last month's October Yahoos had two stories and this month's could have had as many as four. On top of the two shown below, GM Kasparov figured in two others, but not for chess. The first story was widely reported because it's about Magnus and because the premise is decidedly silly. For a typical angle from the chess press, see Frederic Friedel's Beating Magnus after a month of training? (chessbase.com). One of the reasons I follow these Yahoo stories is to read the comments. Here are a few of the better ones. The second story might be a seismic geopolitical shift or it might be FIDE's usual stumbling around with its foot stuck in the trash basket. We'll know by the end of December. Jerusalem (AFP) - Israeli chess players could make history by participating in a tournament in Saudi Arabia after the international chess governing body on Tuesday said it was pushing to allow it to happen. A spokesman for the Israel Chess Federation told AFP seven players had filed requests for visas to participate in the games to be held in Riyadh on December 26-30 as part of the world rapid and blitz chess championships. It took two weeks for the mainstream press to catch wind of the story, but the dress code angle isn't a barnburner. Will a Yahoo chess story turn up in December? Lurking in the composite image I used for Sotheby's Chess was another item worthy of mention (see 'B5' in that post). It makes the sum paid for A Six-Figure Chess Item at Auction look like chump change. 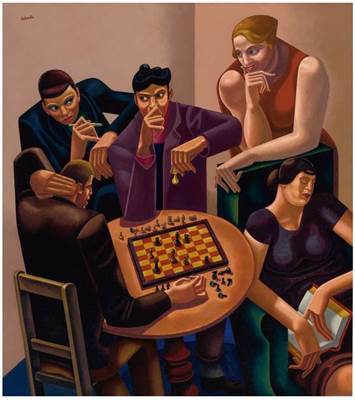 The item pictured below, 'The Chess Players' by William Roberts, R.A. (1895-1980), was estimated at 300.000 - 500.000 GBP (483.360 - 805.600 USD). That's already the highest amount I've ever seen at auction for anything chess-themed, but it sold for even more: 1.161.250 GBP (1.871.006 USD; 'Hammer Price with Buyer's Premium'). Signed; oil on canvas; 101.5 by 92cm. (40 by 36 in. ); executed circa 1929-30. William Roberts R.A. was a British painter of groups of figures and portraits, and was a war artist in both World War One and World War Two. A further Wikipedia link explains that 'R.A.' stands for 'Royal Academician', a member of the Royal Academy of Arts. Digging a little deeper into 'Royal Academy', I might have tapped into another important source of caissart. The Houdini 6 User's Manual has two sections covering tablebases. They discuss technical considerations for downloading the tablebases, installing them, and accessing them from the engine. The choice of two SSDs for storage as opposed to a single centralized one is deliberate. One SSD should be reserved for the six-piece Syzygy tablebases and not be mixed with the one used for the operating system and databases. It will be consulted non-stop by engines in analysis, and it would be a mistake to place it on a drive that is also being used for other purposes, since it could lead to unnecessary slowdowns. What's the future of tablebases? Seven-piece Lomonsov technology hasn't yet arrived for the hobbyist, but it can't be too far off. A back-of-the-envelope calculation tells me that there is a difference of (roughly) two orders of magnitude in complexity (x 100) between an n-piece and an n+1-piece tablebase. An eight-piece tablebase will arrive when advances in processing and storage support it. Beyond that, I wouldn't even begin to guess. Of the two commissions, the SAC produced the more comprehensive minutes. Adding the SAC report that I featured in Applying Chess Skills to Life (May 2017), gives the impression that it is more active than the SPC. The SAC reported on five activities of which I've summarized four in the following composite image showing photos from the minutes. Bottom row, left: "Children of the World" - Spain  'Children from the five continents are again united by the Cross Culture of Chess in this new edition of EXPOCHESS CHILDREN OF THE WORLD. This intercultural project will be presented in Budapest (Hungary) on 14 October at the Global Chess Festival with Judit Polgar. [...] In addition, we will convene one of the main activities of the festival, the second edition of the International Drawing Contest.'  The Polgar Festival was the subject of another post on this blog: Chess Knives Chopping (October 2017). We did for the first time by the SPC Commission an online match between prisoners took place. This historic online international match between prisoners from the project "Chess that Gives Freedom" in the Municipality of Viana, Espirito Santo, Brazil, and the project in Cook County, Chicago, Illinois USA, was held on 17 May 2017, on the FIDE and CBX Online Platform (Chess Arena). [...] The match generated national and international media. Given the potential positive impact on society and on chess, it's a pity the SPC projects aren't explained more clearly. How About a Game of 3D-Chess? Donald Trump supporters [tout] his ability to see moves ahead of his political adversaries. Even after some of his more baffling policy decisions or tweets, they claim Trump is playing 3D Chess, making moves massively more complicated and clever than normal people can comprehend. Most people have never sat down to play a game of 3D chess, and probably only know of the game from a brief scene in a 1976 episode of Star Trek, where Kirk and Spock play it on futuristic glass board on the Enterprise. The 'Amateur Tri-Dimensional Chess League' is a Facebook group -- Amateur Tri-Dimensional Chess League (with rules and notation) -- lightly maintained in connection with Facebook's Tri-Dimensional Chess. Start with the recent eBay post A Six-Figure Chess Item at Auction ('the auction was conducted by the well-known Sotheby’s') and apply the technique described in A Collage of Chess Collages. What do you get? Something like the image shown below. Let's use chess notation to identify the three rows of six images. Calling the rows 'A' to 'C' (from top to bottom) and numbering the images in each row '1' to 'n' (from left to right). The image of the Knight shown in the Google thumbnail is not shown on the Sotheby’s auction page. There it says only 'Image under artist copyright'. So where did Google image search find the image it displayed? 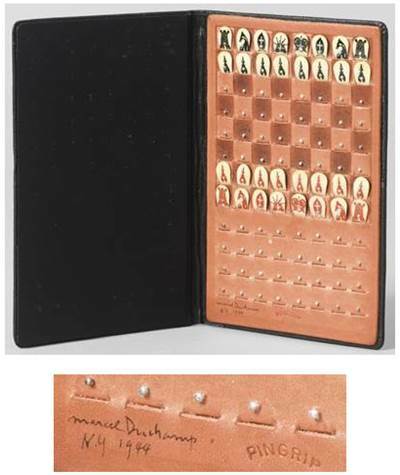 By coincidence, the Duchamp auction brings us full circle to the Pocket Chess Set described in 'A Six-Figure Chess Item'. What other caissart treasures are exposed by this image search? FIDE has just published its annual set of internal documents emanating from its most recent Congress, 88th FIDE Congress: Executive Board Minutes and Annexes (fide.com); 'FIDE publishes the minutes and annexes of the Executive Board meeting that was held in Goynuk, Antalya, Turkey, 13-14 October 2017.' As in nearly every year, they provide the best view that an outsider has of the internal workings of the organization. Just as I've always done after previous Congresses, I looked first at the 2017 Executive Board Minutes. I was not surprised to see that the U.S. sanctions against Kirsan Ilyumzhinov are still FIDE's most pressing issue. I discussed the background for those sanctions in last year's post, Spectating the 87th FIDE Congress (December 2016), and they are not to be taken lightly. According to the U.S. Treasury Department, Ilyumzhinov served as a middleman between two groups who were unable to conduct business openly. Following are initial, relevant excerpts concerning the impact of the sanctions as taken from the minutes of the 88th FIDE Congress, Executive Board meeting. 1. Brief of President K. Ilyumzhinov. [Ilyumzhinov] said that as for his sanctions, are they in the way when he travels, develops and promotes chess? You know that since December 2015 he is in the process of clarifying his situation with the U.S. Department of Treasury. He has officially signed two contracts with the U.S. lawyers who defend his interest in this case. Lately there had been four hearings on his case in the U.S. Dept. of Treasury. He was sure that he will be invited to the USA very soon. As for trips, besides the USA, he is able to visit all countries in all continents. He paid his trips in air company Lufthansa and others, he stayed in hotels and organised events and this did not interfere with his activities abroad. He also established the Chess for Peace Foundation in Washington, London, and Brussels. 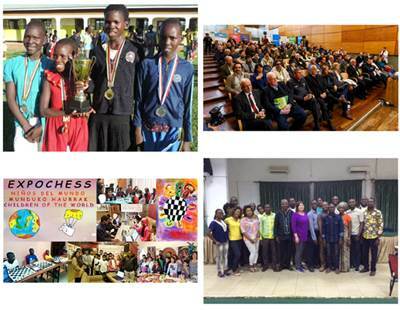 During this year he has organised many events, by paying and assisting through this foundation, to many chess clubs in quite a few countries. He attracted many companies and many businessmen from all over the world. He has received invitations from more than a hundred countries and many Russian regions, to come and give a lecture, to bring books and chess equipment, to attend opening of various chess clubs, and to help chess federations. Yesterday many Presidents whom he met, invited him to visit their countries. I would like to say that after Baku [87th FIDE Congress] we had successfully organized, probably the best World Championship in chess that we have organized, ever in New York. And it was on a very high level organized with great success in media and internet. I think Mr. Merenzon, will refer later to specific numbers. And I remind you that this was an idea of Kirsan to organize this championship in New York. And it was very pity that at the end he was not able to go there. He said that few days before the event, he tried, and they stopped him. One of the most important efforts that we have to do in the last period… it was, despite of the problems that we were facing, to try to keep the stability in our organization. The truth is that it’s not easy. We face really serious problems that I have to refer to them, but what I want to say is that for me, all these problems, they were not political and they were not personal because many times it has been an effort for these problems to be presented as political problems between the people or personal problems. I would like to remind you that in Baku, in General Assembly, there was an effort to go to a voting against Kirsan Ilyumzhinov being president in FIDE under sanctions. It was not clear what exactly the people that had the initiative to present their proposals were looking for, vote of non-confidence, whether they were going to go farther to force Kirsan to resign. We stand by Kirsan, and we make it clear: we understand that the sanctions are a big problem that we have in FIDE, but we don't believe that this Organization should insult Mr. Ilyumzhinov by trying to force him to resign. We don't want this. We're not looking for this, and at least few people there, they made it very clear. I can remember myself, Jorge Vega, Israel Gelfer, that we made very clear that what we believe is that Kirsan should not run to the next elections. And maybe on that moment there were people in the meeting that were thinking that we don't believe really on this, and we say we are expressing this view because we just wanted to protect Kirsan on that moment. The truth is that we really believe this. And we have to make a big effort the next months to convince Kirsan that he should not run. I think Adrian [Siegel, FIDE Treasurer] can refer to the problems that already we have faced with our banks and our insurance company in Switzerland, and the situation, of course, it can be worse in case that Kirsan is the president because now we have stopped everything, all the efforts in Switzerland to take out our accounts from the banks there, because we have explained that Kirsan is not a part of the decision making procedure, that he is not involved in the business of FIDE, he’s our president only. And somehow we convinced them that they should not insist. But the truth is that if Kirsan could win these elections and comes back, they will believe, all of them, that we were cheating them, that we were lying to them, that we are not a serious organization. Immediately they will kick us out. So all these months we were trying to convince Kirsan not to run, to find an alternative. Somebody else could. We had even discussions about the possibility that Mr. Filatov could run. We had discussions even one year and a half about such a possibility or somebody else from FIDE, even from another country. Unfortunately, we could not reach an understanding that this is what we should do in FIDE. Kirsan really wished very much that he should run at least for one more term. 2017-01-04: 2016 FIDE Congress : Whither the World Championship? That should keep me busy for the next month or so. The following table gives a side-by-side comparison of those two sources for the 'most important' components. The premier computer chess event TCEC Season 10 is starting next week with the participation of the strongest chess software. The event will not only be record breaking regarding the ELO and strength of the engines, but also the hardware for S10 will be a 44 core server. Pros travel around the world almost constantly, and the elite players more than any. You might imagine this would mean they are dependent on top-of-the-line laptops, which they certainly have as well, but they all know that a top desktop computer will always outgun even the most formidable laptop. The solution is simply to access their desktop computer remotely, via the internet. Here are the specific hardware recommendations from both sources. What if you could put together three full computers, each with 50% of the performance, for the price of one Threadripper [i.e. AMD Ryzen Threadripper 1950X]? In other words, getting 50% more analysis power at your fingertips. The recommendation would still be one Threadripper. For a discussion of the Dual Xeon 2699, which might be the highest performance hardware currently running chess engines, see Two 22 Core Xeon CPUs!? (youtube.com). I like the use of the chess symbol ('!?') in the title. The item pictured below was titled 'Marcel Duchamp : Pocket Chess Set'. After a starting price of US $160.000, the auction lasted two minutes, with the bid rising by increments of $10.000 every ten seconds or so. The winning bid was $340.000 after 13 bids. PROVENANCE: Harold M. Phillips, New York (a gift from the artist). Thence by descent. CATALOGUE NOTE: Marcel Duchamp had a lifelong fascination with chess. Ostensibly "retiring from art" in 1923, he devoted the next ten years of his life to professional tournaments and by 1925, he had attained the rating of Master from the French Chess Federation. In 1944, Julien Levy organized an exhibition called The Imagery of Chess and asked thirty-two Surrealist artists to submit their own chess set designs. Duchamp submitted an example of his Pocket Chess Set, to which he added a single rubber glove (this work has since disappeared but was later replicated). For more about that exhibition on this blog, see a post from earlier this year, The Imagery of Chess, St. Louis (August 2017). Whenever a chess piece appears solo in a photo or drawing, nine times out of ten it's a chess Knight. Take, for example, another edition of Flickr Friday earlier this year, A Lonely Knight. So far, the photo below has had 2504 views and 41 faves ('favorites', including mine), indicating that its appeal is more than artist inspiration alone. Chess Knight © Flickr user Michal Kosmulski under Creative Commons. 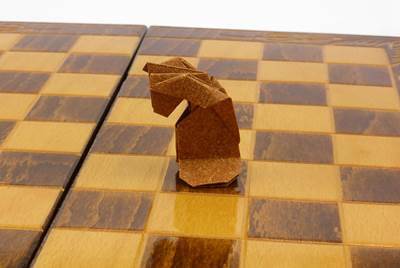 A recent origami design of mine -- chess knight with a corrugation-based mane. The 'Top Contributors' to these groups are also worth exploring. The human brain has a dogged tendency to stick with a familiar solution to a problem -- the one that first comes to mind -- and to ignore alternatives, even when they are superior. The first two pages of the related article are shown in the following image. While we are working through a problem, the brain's tendency to stick with familiar ideas can literally blind us to superior solutions. The water jug experiment is one of the most famous examples of the Einstellung effect: the human brain's dogged tendency to stick with a familiar solution to a problem -- the one that first comes to mind -- and to ignore alternatives. What does that have to do with chess? In recent eye-tracking experiments, familiar ideas blinded chess players to areas of a chessboard that would have provided clues to better solutions. The article (with a different title?!) is available to subscribers on the magazine's site: Why Your First Idea Can Blind You to a Better One (scientificamerican.com). Another, shorter article on the same site, How Psychologists Study the Einstellung Effect in Chess (also March 2014), deals with the chess experiment: 'Cognitive bias can prevent even the most talented chess players from seeing the swiftest path to victory'. The full article (with 'PDF Download Available') can be found on Why Good Thoughts Block Better Ones (researchgate.net). 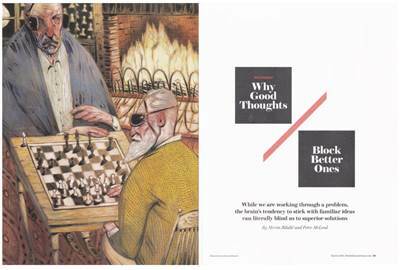 As for the illustration of the two geezers playing chess in front of the fireplace -- which caught my attention before the rest of the article -- it can also be seen on the artist's site, Danny Schwartz Illustration. Articles in Scientific American occasionally focus on chess to make a point. Recent examples that I featured on this blog were Are Boys Good at Chess? (March 2015) and Chess and EEG (December 2014), and there were more posts before those. It turns out the site has an entire category about the game, 'Recommendations: Discover more publications, questions and projects in Chess'. How have I managed to overlook this for so long? From September 2002 to August 2008, I was privileged to serve as the Chess Guide for About.com. During that time, I produced one feature article per week. Although About.com has an exclusive, perpetual license to use my material, it's unlikely that they will ever use it again. After I left, the company gave me permission to reuse the material: 'It would be fine to use your content as you please.' Here are copies of those articles. 2017–present: Closure of About.com, rebranding to multiple publications under Dotdash  On May 2, 2017, IAC announced that they had renamed About.com to Dotdash, after about a year of transition. CEO Neil Vogel said that the company had lost mind share, and needed to change their marketing strategy. The company elected to refocus on vertical markets through its niche websites: The Balance (personal finance), Lifewire (consumer electronics), The Spruce (home and food), VeryWell (health), TripSavvy (travel), and ThoughtCo (education). It turns out that chess is now included under 'The Spruce (home and food)', and its current address is thespruce.com/chess-4127460. Kids crafting tips? Talk about clueless! For more about the most recent transition, see About.com launches The Spruce, a standalone site for Home Decor and Food (techcrunch.com; February 2017). FirebrandX, a player and blogger on the Chess.com site, advises he's in the process of building a new computer for advanced chess. He revealed his list of components with the estimated street price of only $2325. I happen to be in the process of starting a new build. [...] I decided the Intel Hex core [Hexa] was the best way to go instead of the infinitely more expensive Xeon machines. Make sure that the CPU, motherboard, and RAM you choose are compatible with each other. You can do this by checking the socket information on the store page. [...] The CPU, motherboard, RAM, and cooling are all the most important, so budget most of your money towards those. Intel Core is a line of mid-to-high end consumer, workstation, and enthusiast central processing units (CPU) marketed by Intel Corporation. These processors displaced the existing mid-to-high end Pentium processors of the time, moving the Pentium to the entry level, and bumping the Celeron series of processors to low end. Identical or more capable versions of Core processors are also sold as Xeon processors for the server and workstation markets. As of June 2017, the lineup of Core processors included the Intel Core i9, Intel Core i7, Intel Core i5, and Intel Core i3, along with the Y - Series Intel Core CPUs. As for the other recommendations, the table gives enough info for further investigation. At first I was puzzled why chess engine users would want to build their own systems from scratch. Then I realized that it's standard operating procedure in the larger community of gamers. Where's the chess capital of the USA? Some people think it's St.Louis, as in How St Louis became America’s chess capital (economist.com), but how many New Yorkers would agree? Shot on location at: Union Square; Washington Square; and Chess Forum, Thompson Street. By one of those coincidences that can't be explained, Chess Forum was featured on this blog a week or so ago: Multi-dimensional Chess Imagery. This edition of Video Friday is in fact a series of six videos, with promises of more to follow. Since 2004, the University of Texas at Dallas has been making an annual 'Chess Educator of the Year' award. The winner in 2010 was Scottish Grandmaster Jonathan Rowson (wikipedia.org). For clips of other acceptance addresses from other years, see Chess Educator of the Year (utdallas.edu). Although GM Rowson's work has been mentioned several times on this blog (see, for example, Chess Psychology/Philosophy; June 2013), it was discussed more extensively on my chess960 blog in Rowson's 'Three Types of Theory' (February 2011). Let's use chess notation to identify the three rows of six images. Calling the rows 'A' to 'C' (from top to bottom) and numbering the images in each row '1' to '6' (from left to right). The image in the top row, left ('A1') is from Chess club in a collage (chess.com), where someone meant 'college', but typed 'collage', and someone else gave an example of a chess collage. This must be a common mistake, because Google confirms 'collage' before executing the search. The image in the bottom row, right ('C5') is from Marcel Dzama: A Game of Chess (seesaa.net). The original image is titled 'The Hyper-modern Revolution' (2011), and is explained as 'Diorama: wood, glass, cardboard, paper, collage, watercolor and ink'. The rest of the page is full of unusual chess imagery. As for the other images in the collage of collages they all tell other stories. What copyright issues are involved? I really don't know. Google freely uses the images returned by a search, without permission from the owning sites. If the owner of an image asked me to remove it (which has happened twice in the 20 years that I've been creating material for the web), I would have to research the question of 'fair use' in this specific context. In the meantime, I have a few other ideas for chess collages. In that 'Choosing' post, I described the way I use an online database to keep up with opening theory. Basically, I start by looking at what the top players have been playing in a particular variation during the last couple of years, then broaden the parameters as the game goes deeper. I discovered that none of the databases could support this methodology and I decided to continue using the same toolset as before, accepting an increased security risk. The database I've been using, Chesslab, was conceived around the year 2000 and is based on Java. This was adequate at the time, but the times have changed and the technology is no longer robust enough to protect against malicious activity, which is nowadays the primary disadvantage of doing anything online. Earlier this year, Firefox withdrew support for Java, effectively disabling Chesslab. Explorer still supports Java, but throws up so many warnings that I have to doubt my judgement in continuing to use it. On top of this, the downloaded PGN files are not usable 'as is' and have to be converted into a text format that can be loaded into PGN readers. These days my main interest in online correspondence chess is chess960, where online databases have no value in the opening. A year or so before those posts on online chess databases, in Cup Play (May 2013), I wrote about continuing to play the traditional start position ('RNBQKBNR'). A new tournament will start in a week. If I play, I'll need a database to guide me through the opening phase, but which database? Looking again at the work I did in 2014, there was one service that was still under development, Chess-db.com. I decided to take another look at it. Indeed, its 'Opening Explorer' is now an improvement over what I found in 2014, and in the direction of what I need. It has a filter on rating, but no filter on when a game was played. Is the glass half-empty or half-full? Unfortunately, the filter on rating is not up-to-scratch. It restricts results based on the rating of the player(s), but unnecessarily adds a +/- 100-point band around the search. If I'm looking for the current practice of 2700+ players, I don't want 2600 players included in the search, but I do want 2800 players. In addition, the results look dubious. Here is a side-by-side comparison of the results for the traditional start position filtered on a 2700 rating and on 2800. The results are identical, indicating that something is amiss. Having said that, the ability to go deeper into any variation and see what top players have tried is an advantage. Is this good enough for a tournament section of six games? The event will be the quarterfinal stage of a multi-stage tournament. Because I always prefer to finish what I've started, I'm reluctant to abandon the tournament now. In the 'Resurrecting' post mentioned above, I wrote, 'As for giving up traditional chess and switching to chess960, I am certain that day will come. It just won't be today.' Perhaps that day is now. I have a week to decide. The first step to attain the objective established in Engine Trouble ('to investigate what sort of engine setup I would need to improve my result') was to Improve Engine Software. The second step will be to 'Improve Engine Hardware'. Because the subject is so broad, this can't be covered in a single post. If purchasing a new computer, order the largest power supply, speediest motherboard / multi-core processor, most memory, largest hard drive and best cooling system you can fit into the case. Think high-end gaming machine, not a generic or "internet" computer. You will need a "deep" or multi-core version of a chess engine and 64-bit motherboard version of Windows®. And, last but not least, enough memory (8, better 16 gigabytes) to hold the millions of positions generated by an engine. In other words, the more parallelism in the system, the better. The top chess engines thrive on multi-processing. You will not be able to purchase such a computer for $500 at Best Buy or Walmart! A desktop x64 with i7 processor (4 actual cores, not 2 cores and hokey hyper-threading) and 16 gigabytes of memory will be more like $2.000. In other words, be prepared to spend more than you usually spend on computing equipment. Robert Houdart advertises his state-of-the-art chess engine, Houdini 4 Pro, as capable of utilizing 32 threads (16 cores) and 256 gigabytes of hash memory. There's not a PC in the world can meet those standards (Intel and AMD just began offering 8, 10 and 12-cores in a single processor configuration). One must move up to the workstation class of computer to run that many cores and that much memory. A multi-core processor is a single computing component with two or more independent actual processing units (called "cores"), which are units that read and execute program instructions. The 'Advanced Chess' article I've been quoting also mentions a 'dual quad-core machine'. A photo of one is shown below, where the two processor chips are easily seen on the left.. 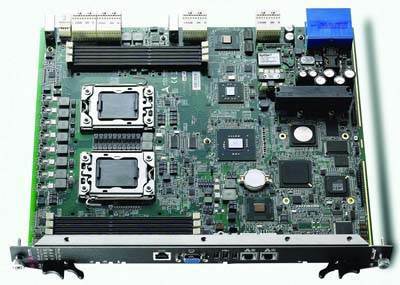 The aTCA-6100 features two 2.13 GHz quad-core Intel Xeon 5500 series processors, Intel 5520 chipset, up to 48 GB of DDR3 memory, and an optional PICMG mid-size AMC bay for maximum computing performance and flexibility. For each processor core that is physically present, the operating system addresses two virtual (logical) cores and shares the workload between them when possible. The main function of hyper-threading is to increase the number of independent instructions in the pipeline. In the next post in this series, I'll go a little deeper into these concepts. Life is full of coincidences. The previous post, Multi-dimensional Chess Imagery, was about 'Marcel Duchamp in the Village [NYC] - 50 Years Later', and this current post, the next in the long-running series Top eBay Chess Items by Price (March 2010), is also about Marcel Duchamp. Titled 'MARCEL DUCHAMP : The Chess Players (Schwartz 621)', the item shown below sold at live auction for US $8000 after seven bids. The starting price was $5000 and the entire auction lasted less than 90 seconds. MARCEL DUCHAMP: The Chess Players (Schwartz 621)  Estimate: 14,000 - 18,000 USD  Plate: 437 by 574 mm, 17 1/4 by 22 5/8 in  Etching, 1965, signed in pencil, dedicated 'for Robert Motherwell', dated and numbered 25/50 (total edition includes ten artist's proofs), on handmade laid paper, framed. CONDITION REPORT: The full sheet. Faint light-stain, slightly darker at mat opening and slight undulation to the sheet. Adhesive residue along the right and left sheet edges on the verso, showing through. The margins with a few tiny fox marks and spots of surface soiling and some slight creasing. The verso unevenly toned, with a few fox marks and traces of surface soiling. I couldn't remember seeing Sotheby’s on eBay. The seller's feedback listing was a modest 'sothebys (23); 90.9% positive feedback', with the earliest item going back about 18 months. The relatively low feedback rating seems to be related to shipping costs and communication problems. Arturo Umberto Samuele Schwarz (born 2 February 1924) is an Italian scholar, art historian, poet, writer, lecturer, art consultant and curator of international art exhibitions. He lives in Milan, where he has amassed a large collection of Dada and Surrealist art, including many works by personal friends such as Marcel Duchamp, André Breton, Man Ray, and Jean Arp. Wikipedia's first selected work concerning Schwarz is 'Marcel Duchamp: Sixty-six Creative Years; From the First Painting to the Last Drawing, Gallery Schwarz (Milan, Italy), 1972'. Is that the origin of the numbering? Whatever the origin, the Schwartz/Schwarz confusion is rampant in the art world. This is one of those Flickr Friday photos that has little to do with its related story. I could have picked almost any photo from the album, Marcel Duchamp in the Village, 50 Years Later, but I liked this one because of the chess memorabilia on the wall. Artist Serkan Ozkaya in conversation with poet Robert Fitterman © Flickr user Greenwich Village Society for Historic Preservation under Creative Commons. For twenty years, Marcel Duchamp secretly worked on his final art piece, Étant donnés, in his New York City studio. After his death on October 2nd, 1968, his close friends and the world were stunned to find, hidden in his studio on East 11th Street in the former St. Denis Hotel, the completed Étant donnés, an elaborately detailed and beautifully disturbing room-encompassing tableau, which could be peered at through two peepholes upon entering the room. That's all very nice, but what does that have to with chess? Join artist Serkan Ozkaya and poet Robert Fitterman for a conversation about Duchamp's enigmatic final work and contemporary artists' response to it. [...] Chess Forum is the perfect venue as chess featured throughout Duchamp's career, from his early painting Portrait of Chess Players to Reunion, the performance/chess game he staged with John Cage in 1968, and Duchamp frequently played the game in Greenwich Village. For more about the artwork, see Wikipedia's Étant donnés. Google translates the French phrase as 'Since', but I'm sure there is more to it than a single word. For more about New York City's Chess Forum, see chessforum.com ('Your Gateway to the World of Chess'). As for the memorabilia on the wall, it's not all about chess. 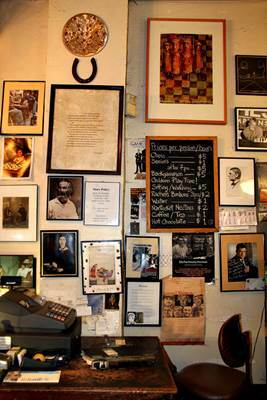 Partly visible to the left of the chalk board ('Prices per person/hour: Chess___$5 ...'), is a small poster for the documentary 'Game Over - Kasparov and the Machine'. To the right is a sketch of Ralph Waldo Emerson, whose connection to chess is tenuous. The large frame under the horseshoe is an an excerpt from T.S.Eliot's poem 'East Coker' (1940), that starts 'You say I am repeating / Something I have said before'. Beneath that poem is American poet Walt Whitman, and to the left of Whitman is a scene from 1886 Steinitz - Zukertort, 'the first match for the title of World Chess Champion accepted by all chess historians'. Other photos from the Flickr album also show walls filled with both chess and non-chess imagery. Who said chess players are two-dimensional only? 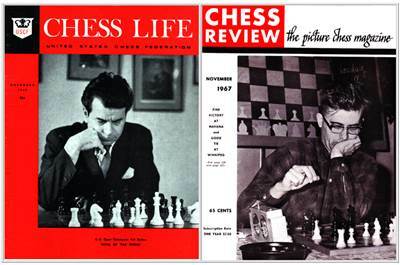 Fifty years ago, the two major American chess periodicals both featured players who, on multiple occasions, reached the World Championship Candidate stage. The first three CL articles were about Benko. Bent Larsen, our doughty Dane who scored so well in the Interzonal at Amsterdam in 1964, is hitting the high spots again -- possibly in anticipation of this year's interzonal (being held in Sousse, Tunisia). Larsen won a fine first in the Capablanca Memorial at Havana ahead of Marc Taimanov of the Soviet Union, defeating Taimanov in the process. He also turned in another fine performance at Winnipeg, but Klaus Darga of West Germany equaled it. The two tied for first, ahead of an all-grandmaster field, at 6-3. But Darga deserves credit for a moral victory, perhaps, as he defeated Larsen and went undefeated himself. Paul Keres and Boris Spassky of the Soviet Union had to settle for a tie for third and four as they scored 5.5 each. Pal Benko of the United States placed fifth with an even five points -- really one up on even. Benko's previous 'On the Cover' appearance was the CR side of April 1967 'On the Cover'. Larsen's was the CL side August 1966 'On the Cover' in a group photo from the Piatigorsky Cup. His previous solo was the CR side of July 1964 'On the Cover'. It used the same photo shown above and also referred to him as the 'Doughty Dane'. Google search defines 'doughty (adjective archaic humorous)' as 'brave and persistent'.